Just in time for a grand and easy to make Fathers Day Breakfast! Bring out your grandmothers cast iron! 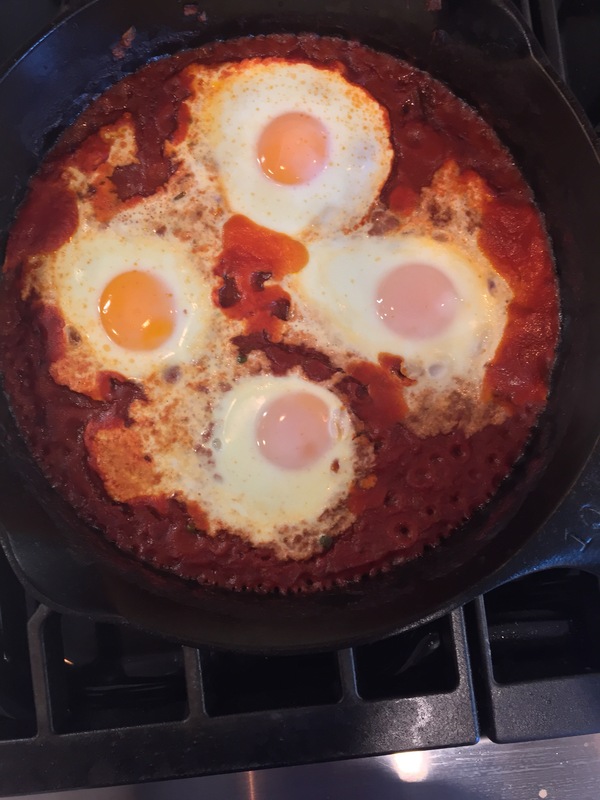 This dish is an Italian style Shakshuka which is a Middle Eastern food made with a salsa type tomato sauce. 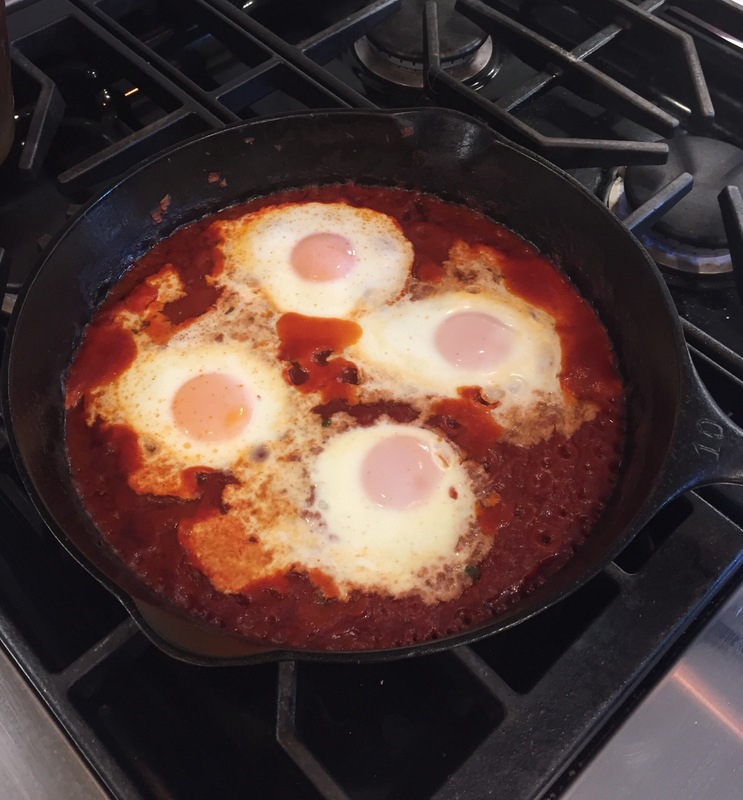 Eggs in Purgatory has chili flakes added to your taste for heat and capers to give a briney almost fishy flavor. It’s like adding anchovies to tomato sauce which wouldn’t be a bad addition to this sauce either! Italian Puttanesca is a tomato sauce with added capers and anchovies for a briney flavor. Italian Arrabbiata is a spicy tomato sauce with added chili flakes. 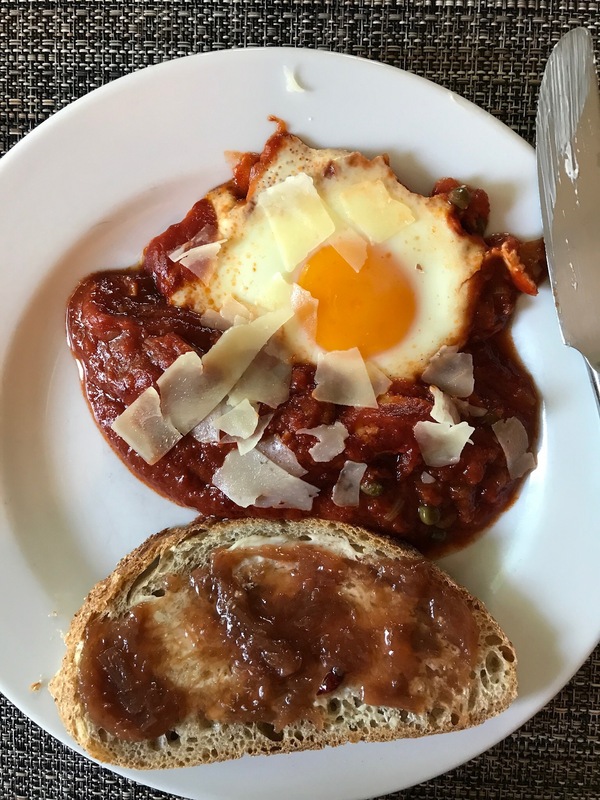 Eggs in Purgatory is a blend of both of these flavorful tomato sauces. Add some toast with rhubarb jam to complete breakfast or brunch that combines the salty with the sweet. I like to sprinkle flaked sea salt over my rhubarb jam toast to add to the salty component. Sauté the chili flakes and stir quickly with a spoon or spatula until fragrant, less than a minute. Add the onion and sauté until translucent, turning down the heat as needed to prevent browning. Add the garlic and sauté only a 1/2 minute while stirring. Do not brown or burn! Add the tomato sauce, capers and brine. If you want to add the anchovies, do it now. Simmer uncovered until thickened, simmering slowly. About 20-30 minutes. Bake 9-10 minutes or less until the whites just turn white and still jiggle when shaken. Posted in main dishes and tagged arrabbiata sauce, baked eggs, breakfast, brunch, eggs, puttanesca sauce, shakshuka, spicy tomato sauce. Bookmark the permalink.